Socks are a wonderful knitting technique, easy to learn, mesmerizing and addicting needlework…. 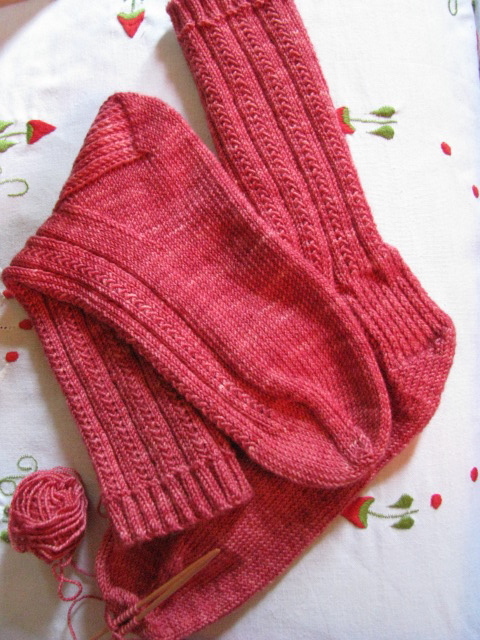 The pattern by Adrienne Ku is called Simple Skyp Sock which is a free download on Ravelry. 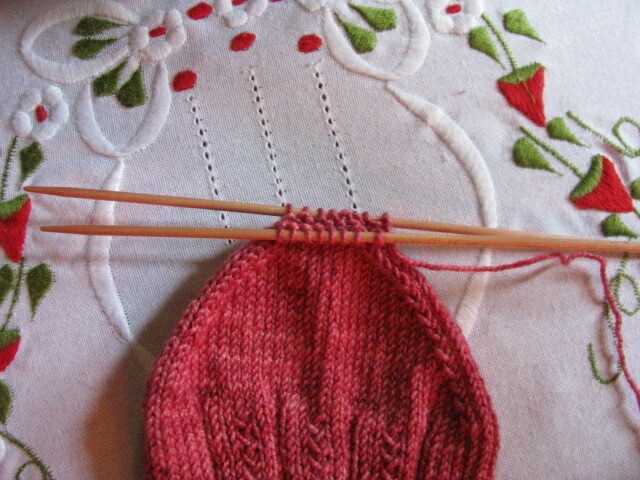 Adrienne’s explanation for turning the heel is so easy and a great introduction for first time knitters of sox. There are only two rows of pattern stitch and the “skype” as Adrienne has dubbed it, makes the pattern interesting and not so blah! as plain stockinette socks. The pattern is available in size medium and large men’s and will make a great gift for hubby, grandpa, or boyfriend’s birthday or holiday giving. Problem is, once they grow accustomed to hand knit socks, they won’t want to wear anything else. You don’t need any elastic, as sock yarn has a springy texture and the ribbing cast on keeps the sock up. Because the yarns were different textures, for this strawberry pair, I used a size US 2 needle, and the large size pattern. So check the gauge of your yarn and decide, what the correct notions and pattern size is for you. Socks are a great traveling companion, small and portable. You can knit while you commute to work, on the bus, train, or plane. At the beach or at a ballgame, you’ll be knitting socks right out of your purse. To close the toe, you will need to learn the Kitchener stitch, and I’ve found this great video on YouTube that explains the grafting of the toe in a simple way to understand. Every time I need to graft any knitting project, I always return to this video. There are many videos on YouTube which describe the Kitchener stitch and how to graft the toe, but this one has a singsong theme, which makes remembering the stitching easier, AND there are no ads. Kitchener Stitch how to video. You will need a yarn sewing needle and two double points with an even number of end stitches on each needle. If you have any questions at all, feel free to email me, spwatt at cox dot net. I know you will love knitting socks. For another super easy beginner sock pattern on larger needles with DK yarn, check out this free sock pattern. Love those socks! I wouldn’t have given them a second glance had I just been browsing the patterns on-line but your colorway AND photography make me want to start those socks ASAP! And I should have thanked you for the crankypants pattern you shared earlier. I plan to make some for my twin granddaughters. Thanks, Patti, love your lace hem topping pattern and your description of making it, so honest and entertaining. Your article/tutorial is absolutely fabulous. You continue to exceed my expectations! You must be talking to me. I keep saying I will try something like this but I think it will be over my head. Love this pattern and the yarn color is beautiful. I have to make time to do this! Your website was sent to me by a dear friend, and I am eternally grateful to her! Please forgive my idiocy, but how do I obtain the free sock pattern? It is gorgeous, and they do not appear to be so hard that perhaps I couldn’t at some point figure them out. I am getting ready to have right knee and left ankle surgery soon and will need something to challenge me. I think these are perfect! Thanks for any help you may be able to give, and also for sharing your awesome talent with us! Well…I get the “Idiot of the Year” award! I read the post…and then I re-read it after posting the former post to you requesting how to get the pattern…and THERE IT WAS AS BIG AS DAY…downloable @ Ravelry! Please forgive me for taking up your time, but at least I was afforded the opportunity to compliment your gorgeous work! Thanks for your patience with me! Dee, thank you. Have had many comments about the strawberry socks, yarn purchased on Etsy, now knittinglikecrazy.com. 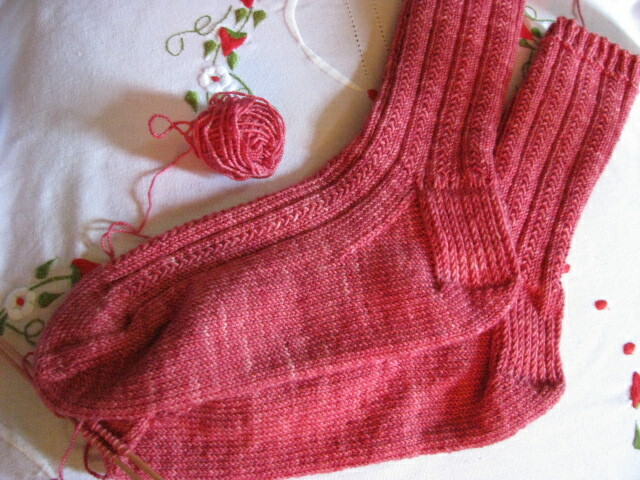 I have emailed Jen and asked about the wild strawberry sock yarn. You can also reach her on her blog. Good luck and thanks so much for reading. I made both the medium and the large size, think the medium will fit a size 9, just shorten the distance between the heel and the toe decrease. Good luck with your socks.